Curator Sushma Jansari explains Holi, and highlights some of the remarkable paintings in the Museum's collection depicting aspects of this Hindu festival. The Hindu festival of Holi is a colourful and vibrant celebration of the arrival of spring. It is celebrated across India and Nepal, and among the Hindu diaspora around the world. 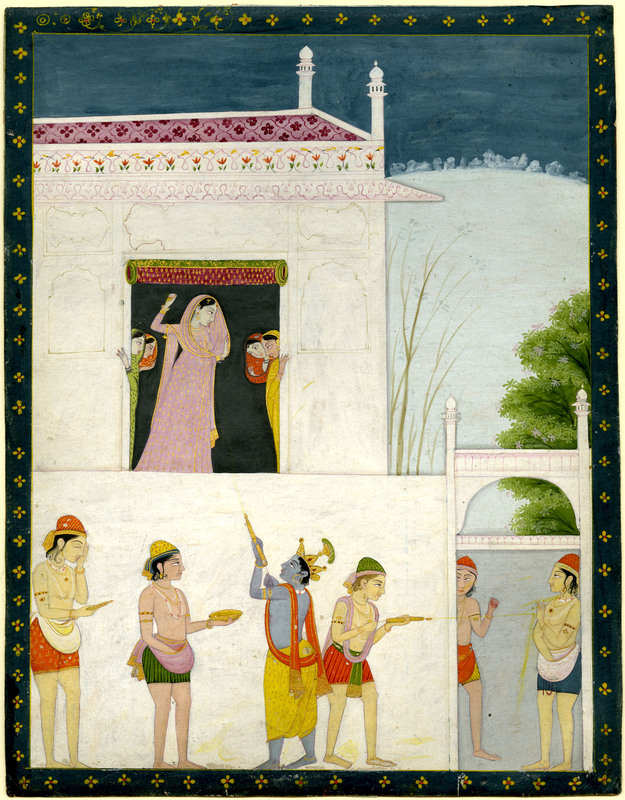 Krishna squirting coloured water at Radha. Painting, Pahari School, early 19th century. The three main myths associated with Holi involve the Hindu gods Vishnu, Krishna or Shiva. People in various parts of India focus on different forms of each of these myths. One of the most popular stories concerns Vishnu and his devotee, Prahlada. According to one version of this story, Prahlada was the son of an evil king named Hiranyakashipu who demanded that everyone should worship only him. Prahlada refused to worship his father and instead continued to pray to the god Vishnu. Holika, King Hiranyakashipu’s sister, grew angry at Prahlada because of his devotion to Vishnu and decided to kill him. She had been previously blessed by the gods so that she would not be harmed by fire, so she tricked Prahlada into sitting on her lap while she sat in a fire. Prahlada survived this ordeal because he prayed to Vishnu, while Holika perished. ‘Holi’, the name of the festival, is derived from the name ‘Holika’. 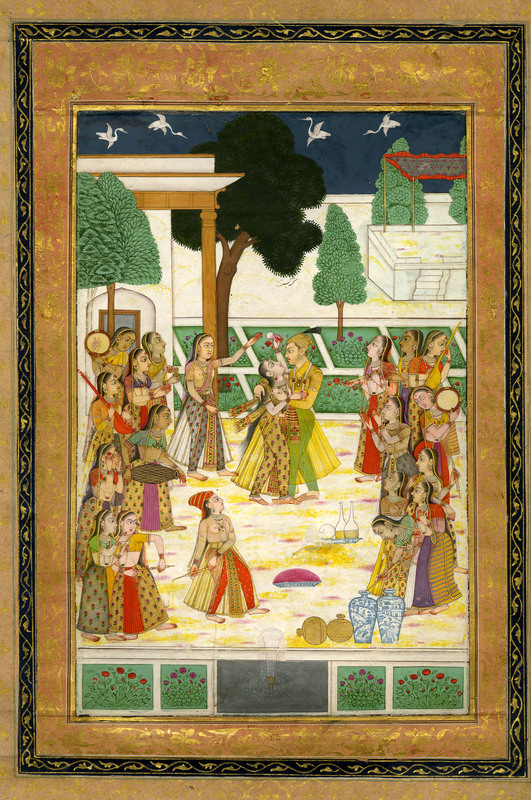 Krishna and Radha surrounded by women who are playing musical instruments and throwing coloured powder at them. Painting, Rajasthan School, early 19th century. Another story linked with Holi is about Krishna’s love for Radha. Krishna’s skin was dark blue because a demoness had tried to poison him when he was a baby, and Krishna was worried that Radha wouldn’t like him because of his appearance. 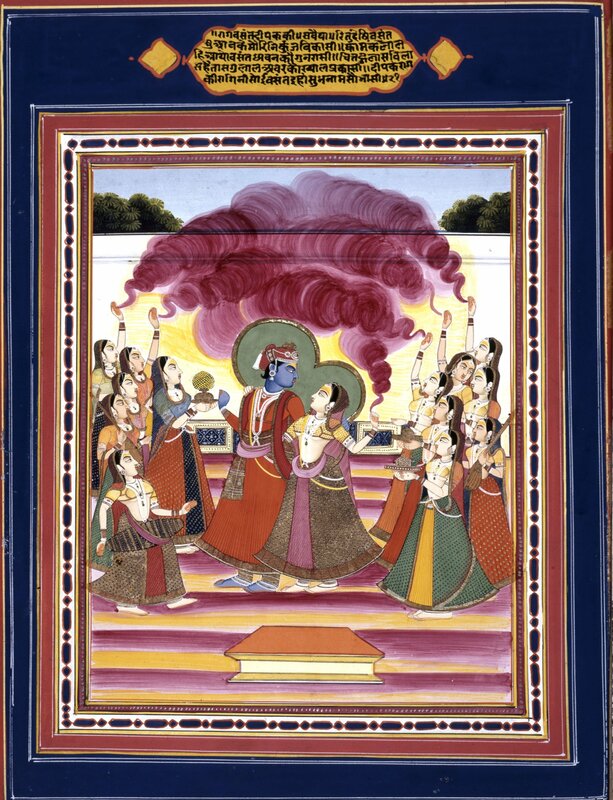 His mother, Yashoda, playfully suggested that he smear some brightly coloured powder on Radha’s face. After Krishna did this, Radha fell in love with him and they were later married. There are two main parts to the festival of Holi. The first part is called Holika Dahan and falls on the night of the full moon during the month of Phalguna, which falls between February and March. Bonfires that have been built with an effigy of Holika on top are lit, recalling the moment that Holika perished in the flames while Prahlada survived. The following day, people gather outside to sing, dance and throw coloured powder and squirt coloured water at one another, which recalls the moment when Krishna rubbed coloured powder onto Radha’s skin. It is a day of fun and jollity when traditional social conventions are disregarded. Nobleman and woman standing on a terrace and using pichkari to squirt coloured water at one another. Painting, Rajasthan School, mid-19th century. The playful throwing of coloured powder is commonly depicted in miniature paintings, and the British Museum has some beautiful examples. 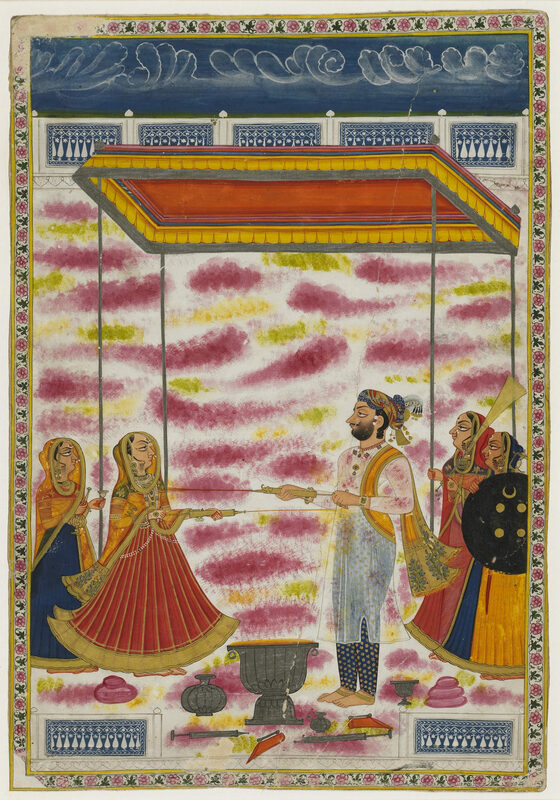 Some show the playful moment between Krishna and Radha, while others depict rulers and their attendants in their palace gardens throwing coloured powder and using long metal syringes called pichkari to squirt coloured water at one another. In 2018, Holi will be celebrated between Thursday 1 March (evening) and Friday 2 March (daytime).